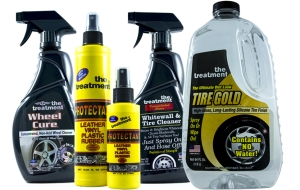 The Treatment® retail line utilizes decades of experience in marketing quality products to car collectors, show car owners and professional detailers. We offer a worldwide reputation for providing the highest quality cleaning and detailing products available. 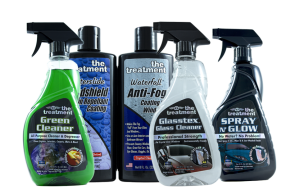 Each item in The Treatment® product line is easy to use, non-abrasive, and incorporates the latest advancements in technology and chemical innovation to deliver the ultimate in shine and protection to any automotive surface. All of The Treatment® soaps are environmentally friendly. Crafted to deliver ultra high-sudsing action and a streak free clean rinse. 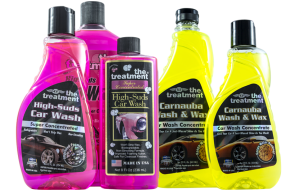 Choose from High-Suds Car Wash for a thick creamy easy to rinse lather, or our world famous Wash & Wax Car Wash Concentrate that gives you a fresh waxed shine with the ease of washing your car! Our special formulas dissolve easily in hot or cold water. After washing, water will bead on the surface, eliminating spots and streaks. 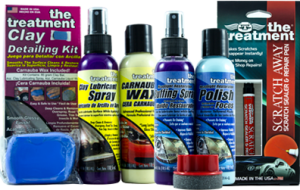 We offer a full range of silicone and non-silicone protectants and dressings for all rubber, vinyl and plastic parts of the vehicle. Protectants for all interior parts of the auto, and super glossy tire dressings for the tires. A full range of protection for these surfaces in a variety of formulations resulting in a long lasting shine. Restores dull, faded trim and difficult to remove wax residue, while protecting the surface from future sun damage. Works as well on worn tires as well as on showroom new tires. We offer high quality, oil based air freshener sprays. 8 different scents in all. Packaged in durable glass bottles, strong enough to hold our quality fragrances. Choose from 2 different standard case packs, each with a full color fold-out retail display and 4 unique scents. Easy to use non-aerosol spray, handy enough to carry with you or keep in the glove box. Or get our famous protectant shine that comes in 3 fresh scents. It’s a protectant and air freshener all in one! 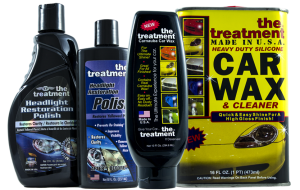 Thank you for your interest in The Treatment® car care products. Here you’ll find our 2018 Retail Catalog in both English and Spanish. Double-click on a page to zoom in or out. In the toolbar you can expand the catalog to full screen, print or download a FREE copy, search and share the catalog.